MELBOURNE, Australia -- There certainly are easier sibling challenges than defeating the Williams sisters in consecutive matches at a Grand Slam. Maybe outracing baseball's Molina brothers in a sprint. Finding a Manning brother TV commercial while channel surfing. Getting one of the Kardashian sisters to pose for a photo. 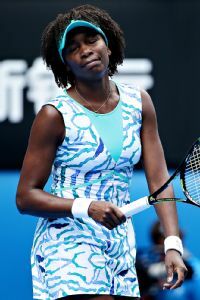 Only seven players, however, have defeated Serena and Venus Williams in the same tournament: Kim Clijsters (twice), Arantxa Sanchez-Vicario, Steffi Graf, Martina Hingis, Lindsay Davenport, Justine Henin and Jelena Jankovic. That's an impressive list of players, and only Hingis, Henin and Clijsters did it at a major. No one has done it since Jankovic beat them both at Rome in 2010. The next person with a chance to do so? Madison Keys, whom many see as the next big thing in American tennis. "The sky's the limit,'' Venus said. Keys' tennis career was inspired by Venus -- or at least, by her dress at a long-ago Wimbledon -- and she has taken that career to the Australian Open semifinal by beating Williams 6-3, 4-6, 6-4 on Wednesday. It wasn't an easy victory, and Thursday's semifinal won't be any easier. Keys is just 19. She has never played in a semi at a major, let alone won one. She is playing against Serena, the world's No. 1 player for the past 100 weeks, an 18-time Grand Slam champion and a five-time champ here. Madison Keys said her left thigh was still bothering her after her come-from-behind win over Venus Williams. Also, Keys will be playing without a day of rest while dealing with a strained abductor muscle in her left leg. An abductor injury forced Keys to withdraw from a third-round match at Wimbledon last summer, after she had won at Eastbourne. She has felt it a bit here as well but hadn't had a serious issue until the sixth game of the second set, when the muscle suddenly went very tight on her. She quickly flashed back to that day at Wimbledon, panicked she would have to withdraw again. Keys took a medical timeout for treatment, returned with a wrap on her thigh and won the next three games before losing the set 4-6. She fell behind Venus 3-1 in the final set but rallied to win 6-4. She said after the match that the muscle still hurt, and she will be getting more treatment for it. "I'm hoping I can get it as good as possible for tomorrow," she said. Serena, meanwhile, is dealing with a virus that has been worsening over the past week. She had better hope it's not the same virus that forced Novak Djokovic to postpone a practice leading into the tournament or the one that sent Varvara Lepchenko to the hospital. Keys has never played Serena, but she is being schooled by a recently hired coach who did. Lindsay Davenport played Serena 14 times in her career, including when she beat Serena and Venus in Los Angeles in 2004. Venus Williams had 38 unforced errors and just 10 winners against Madison Keys. Davenport should help Keys prepare, though Serena also has a source for advice about her semifinal opponent: Venus. In addition to their considerable skills, the sisters' being able to advise each other is probably another reason only seven women have beaten them in the same tournament. Actually, there is one other person who defeated the Williamses at a major, and that athlete beat both in the same day. That was Karsten Braasch, the man who beat the two in single-set matches in a friendly, male-female competition during the 1998 Aussie. It won't be "just for fun'' for Keys and Williams in the semi. "It's good to see another American, and another African-American, in the semifinals playing so well,'' Serena said. "Regardless of who wins, there is going to be an American in the finals, so that is great.